“It’s the most beautiful thing there is, to be able to do what I want because I feel free. A person without independence would be as good as dead,” a 71-year-old woman from Costa Rica said. Older people explore their right to be able to make their own decisions and live their lives according to their own values and preferences in a new HelpAge International report launched to coincide with World Health Day 2018. 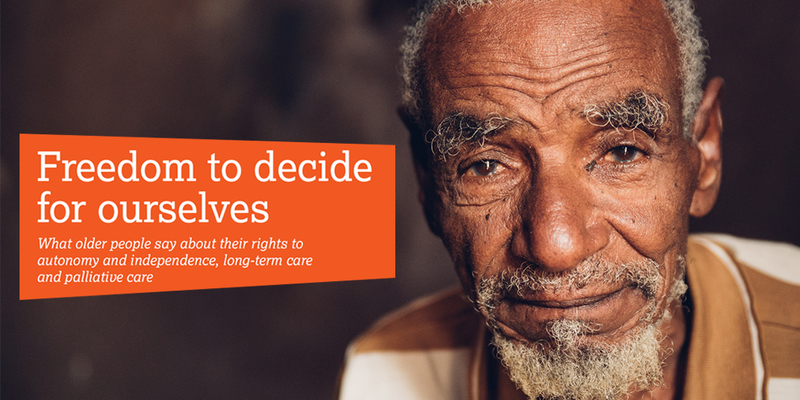 Freedom to decide for ourselves brings together the findings from a consultation with 450 older people in 24 countries to find out their perspective on their rights to autonomy and independence, long-term care and palliative care that are central to human dignity. We found that as people age, the autonomy and independence they enjoyed earlier in their lives is often denied by the negative, ageist attitudes of those who believe older women and men are unable to make their own decisions, or disregard those choices when they do. This is perpetuated throughout societies – from governments and local authorities, to local leaders and family members. It prevents older people from making important decisions about their finances, employment, living arrangements, family life and participation in community life. “Nowadays my children and younger villagers don’t see my worth any more. They make decisions without me participating. They can decide to sell some of my property without telling me,” said an 81-year-old man in Tanzania. This denial of autonomy and independence is often most pronounced during times of change, such as deteriorating health, a fall in income, or moving to live with a family member. This leads to greater dependence on others who may exploit this to take away their freedoms. This dependence is especially evident in older people’s health and care. Many participants said there is a lack of access to comprehensive long-term care and support services within their communities or, if they exist, the cost makes them unaffordable to everyone who isn’t on a high income. This leaves families as the only providers and it is often at the cost of an older person’s control over their care. Rachel Albone, Global Adviser on Health and Care at HelpAge International, said: “Without access to care services, older people must depend on their family and community members for support. This often means older people are not getting the quality of care they need and those caring for them are doing so at the detriment to their own health and wellbeing. Justin Derbyshire, Chief Executive at HelpAge International: “There are no explicit standards in international human rights law on older people’s rights to autonomy and independence, long term care or palliative care. Without them, these fundamental rights cannot be protected. Download Freedom to decide for ourselves and join our Age Demands Action campaigners in using it to lobby your government on older people’s rights.